We have all seen them on I-10, driving down Speedway or Kolb Road — chatting or texting on their cell phones while driving; or eating and fiddling with the radio. While Arizona legislators recognize the dangers of talking and texting, there is no law in our state prohibiting this dangerous habit, and no sanctions yet. If you are injured in a car accident by a driver who was texting or talking on the phone, you may be entitled to compensation for your injuries. Turn to an experienced personal injury attorney — someone who can protect your rights as an injured victim, zealously pursue compensation, and look out for your best interests throughout the process. 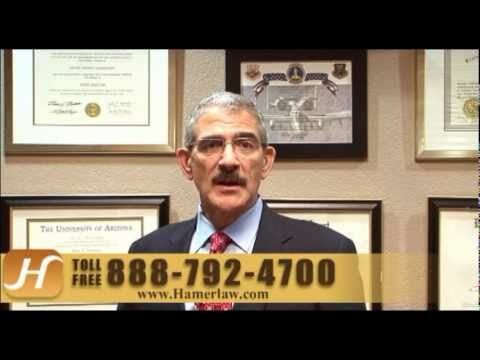 The attorneys at The Hameroff Law Firm, P.C. have more than 25 years of experience in personal injury law. Contact us today at info@hamerlaw.com The Hameroff Law Firm, P.C. today for a confidential consultation in our Tucson law offices. Arizona is an at fault state. That means that if you have an accident in Arizona, the negligent party’s insurance company will pay out according to the fault or liability of each driver. Typically, distracted drivers carry a heavier degree of fault. When we accept a personal injury claim, we investigate the accident thoroughly in order to build a strong case. Our attorneys obtain a copy of the police report, and confer with witnesses in order to establish negligence. If you have been injured by a distracted driver, you deserve compensation for the wrongful actions of a careless motorist. Money damages may include medical expenses, lost income, and related accident expenses. We also handle wrongful death claims for the loss of a loved one. Call The Hameroff Law firm, P.C. in Tucson at 520.792.4700 or 1.888.792.4700 today to discuss your claims with a qualified lawyer or send us an email at info@hamerlaw.com to schedule a confidential consultation.